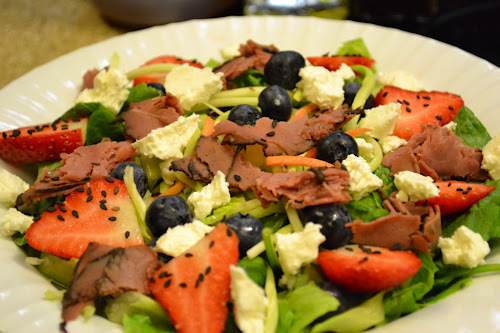 Over at Julie's: Healthy Summer Salads Should be Beautiful and Tasty! Healthy Summer Salads Should be Beautiful and Tasty! I have been enjoying all the beautiful summer fruits available this time of year! They are the perfect addition to healthy summer salads, and the perfect enticement to get your kids to enjoy eating salads! Add some seeds for color and texture . . . These are black sesame seeds found in Asian markets. Everyone is going to have their preference when it comes to salad greens. This time of year we can't grow our own lettuces because of the heat . . . Will and I have agreed on a combo of romaine and baby spinach, and broccoli slaw for our salads, but after that, our tastes differ greatly! This is my supper meal of choice while the weather is hot and humid! My new favorite Dinner Salad begins with a bed of romaine, spinach, and broccoli slaw . . . Then I go crazy with fruit! 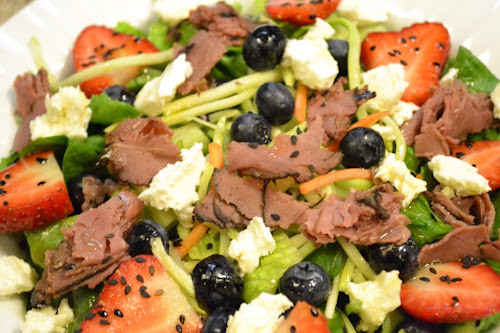 Blueberries, grapes, strawberries, sliced peaches, pears and cherry tomatoes are a few of my favorite toppings! I have fallen in love with Athenos bulk Feta Cheese, but a nice cheddar works well also. I just break it off in chunks and add it to my salad! Sometimes I add celery . . . Sometimes thin carrot slices cut on the diagonal. My choices of meat varies~ ham, deli roast beef without nitrites (when it's on sale at Sprouts), grilled chicken. Boiled or even grilled shrimp would also make a wonderful addition! Don't be constrained by the ordinary! There is still a room for your old standby ~ lettuce and tomato salad (when you can't buy beautiful summer fruits). This time of year . . . live a little! 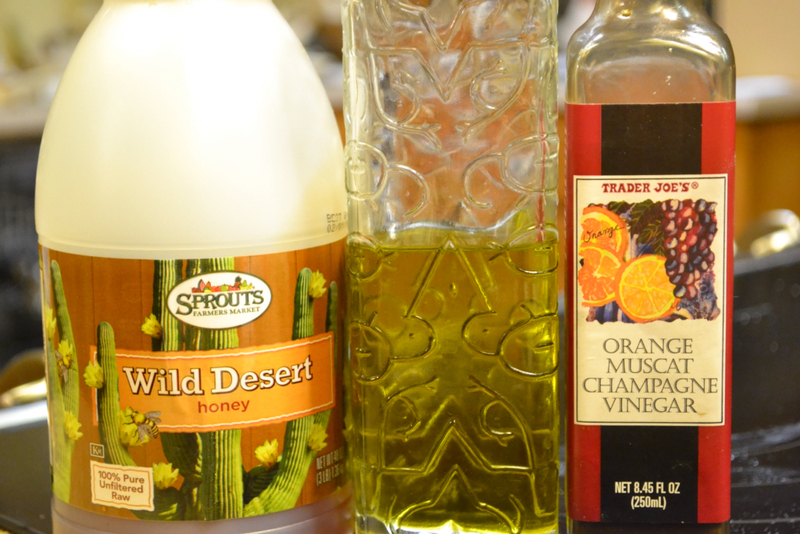 The Trio I use for a quick and tasty vinaigrette! 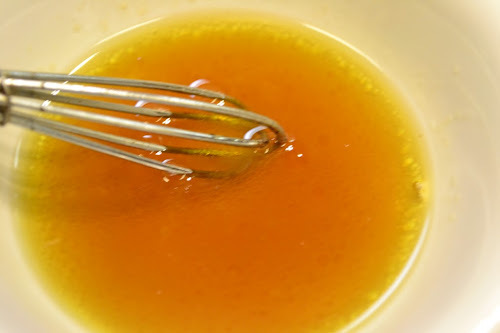 This recipe makes enough vinaigrette for 1 large dinner salad. Increase amounts as needed. *You may substitute Balsamic Vinegar for the Orange Muscat. This makes an especially lite and easy vinaigrette for both fruit and veggie salads. Whisk together and drizzle on salad. Of course, you can also add nuts . . . pepitas, pine nuts, sunflower seeds . . . Whatever you have on hand. I can't think of a better way to get your daily quota of fresh fruits and veggies! By eating them fresh, they are packed with vitamins, minerals, antioxidants, fiber, and enzymes! 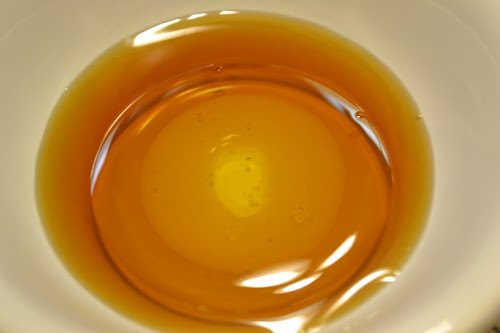 Making your own simple vinaigrette eliminates the soybean oil (GMO) and sugar found in the majority of commercial brands. 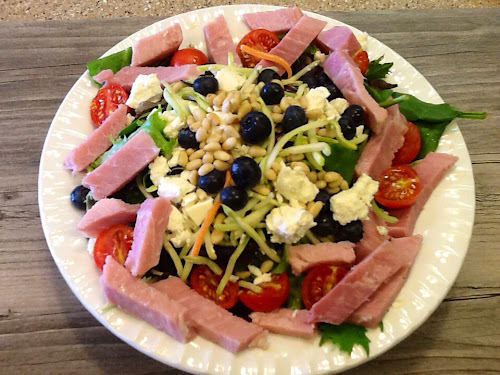 Here's a Dinner Salad made with baby Spring Mix, homegrown cherry tomatoes, ham, pine nuts and feta. When I make a salad for my entire meal, I give it proteins from both lean meat and cheese. I avoid carbs from croutons and sugary dressings. I mix colors, textures, and complimenting flavors to present an eatable work of art and a healthy alternative for a satisfying meal . . . Over at Julie's!!! P.S. ~ If you are currently having trouble with heartburn or acid reflux, this Suppertime Salad Meal will give your body a break from foods that cause heartburn, and will give it time to heal. I have also found that avoiding soft drinks helps tremendously with this issue.